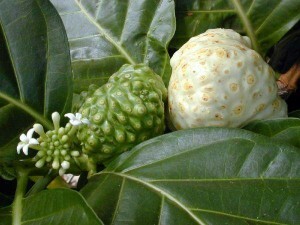 Morinda Citrifolia, or Noni as it’s commonly called, is related to the coffee tree. This tree, or specifically the tree’s fruit, is native to Southeast Asia, but has since spread to other locations. Noni fruit is an excellent source of fiber, not only that, but an amazing source of other nutrients. It has been used by Hawaiians to help with infections. It has also been used, traditionally, to treat menstrual cramps, bowel problems and urinary tract infection. The oil from the Morinda Citrifolia seed specifically has some more modern uses such as topical applications for the skin. There is also exploration into Morinda Citrifolia’s affects on certain diseases. There is an acid, called linoleic acid, in the noni fruit that is of particular interest to disease prevention, most notably with cancer research. In a study of mice, a dietary supplement with the acid was given to them and showed significant prevention properties on the mice after they were injected with cancer causing materials. Infants with cystic fibrosis can also benefit from the acid. Infants fed a diet high in the acid showed marked improvement in their growth. Dermatitis, which is a group of diseases that causes inflammation of the skin, is also helped by the acid. Specific types of eczema were treated with high doses of linoleic acids. Diabetics have also benefited from the acid. There are lots of complications that go along with diabetes and it seems the acid has a positive effect on these complications making them not so prevalent. All of this from Morinda Citrifolia….a plant?